You can't have an Easter egg hunt without Easter baskets, and Prextex offers a colorful and affordable way to make your children's search complete. You'll get a pack of 12 colorful plastic baskets for $19.99 with egg hunt friendly features. These baskets have large openings with durable handles so young treasure hunters can easily grab, stash, and keep going. Each basket measures 6.5 by 5 inches, a size that can accommodate a decent bounty of eggs. Are you looking for an easy way to prepare the Easter ham? Check out Oster's Smoker Roaster Oven that boasts a 16-quart capacity and removable cooking pan that makes both cooking and cleanup a breeze. What's more, this versatile appliance can roast foods to perfection in your kitchen, but also has a unique outdoor smoker function - simply move it outside, add your favorite wood chips, and enjoy rich smoked flavor to a variety of meats and more. Get yours in time for Easter for $60.83 and save 19% off the regular price. 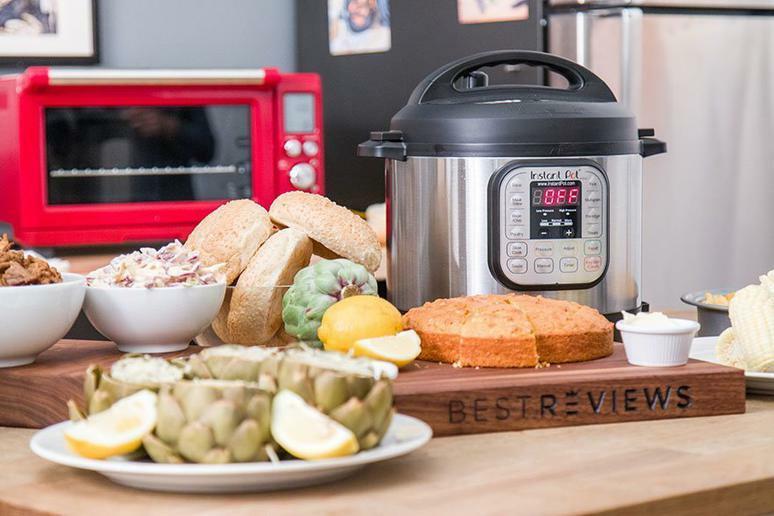 Instant Pot has a family of programmable pressure cookers that make preparing numerous types of dishes simple and fast, whether you are cooking everyday dinner or holiday meals. We love the compact size of the Duo Mini as well as its 3-quart capacity that's perfect for making vegetables and other tasty side dishes. And although this cooker is smaller than others by the brand, don't underestimate its featues, as it can steam, saute, warm, slow cook, and more. You can save almost $20 in time for Easter, because the Duo Mini is currently on sale for the low price of $59.99. Easter dinner wouldn't be complete without delicious baked goodies. Regardless of what you like to pop in the oven, the Rachael Ray Cucina Bakeware Set Has you covered. For the sale price of $56 - a savings of 72% - you'll get 10 pieces with nonstick surfaces so you can make cakes, muffins, breads, and more. In addition to durable carbon steel craftsmanship, each piece has silicone grips on the handles so you can move them from the oven with ease. Whether you want to start your Easter morning with a robust cup of joe or complete dinner with decaf, the Hamilton Beach Single Serve and Full-Pot Coffee Maker makes it easy to brew coffee any way you want it. It's almost like having two coffee makers in one, as you can brew a full 12-cup pot on one side or make single cups at time using K-Cups or pods on the other. It's also programmable, and has a special function that allows you to select the strength of your brews. This week it's $35 off - on sale for only $54.99.